A man pulled his partner’s hair during an early morning row after he had been drinking. Lee Ashworth was under stress at the time after his mother’s recent unexpected death. Ashworth, 36, of Lytham Road, Warton, pleaded guilty to assault and damaging his girlfriend’s mobile phone. He was given an 18 month conditional discharge and ordered to pay £80 costs with £20 victims’ surcharge. Prosecutor, Adrian Hollamby, said Ashworth’s partner, a bar manager, returned home after work on June 18. Ashworth, whom she described as drunk, started an argument over what a friend had been saying. He grabbed her hair and pulled it hard. When she went to call the police he grabbed her phone and threw it on the floor. The prosecutor added that Ashworth’s girlfriend had later retracted her complaint to the police saying the defendant’s mother’s recently death had severely affected him mentally and physically. Patrick Nelligan, defending, said his client had been very close to his mother spending most of his time with her. Ashworth, who had a job starting as a car valeter soon, hoped his relationship with his partner would continue. A man alleged to have led police of a high street chase through the streets of Blackpool has appeared at court. Benjamin Harding is also charged with drug-driving his Mazda car and failing to top when ordered to by police. Harding, 25, of Clevedon Avenue, North Shore, is further charged with driving without insurance and driving without a licence. Matthew Siddall prosecuting told District Judge Jeff Brailsford that Harding was arrested when his vehicle crashed. Harding was sent to Preston Crown Court for trial after he denied all the allegations. He was remanded in custody. A man cracked a window at a Blackpool restaurant after attending his father’s funeral. Paul Burns, 33, of Armouagh Parade, Belfast, pleaded guilty to causing damage. A suspended prison sentence he was on was extended by three months and he was ordered to pay £200 compensation with £85 costs. Prosecutor, Matthew Siddall, said Burns went into Tony’s Grill, Central Drive, on May 28 in the early hours, and staff obliged when he asked if they would charge his phone. Burns was then seen to pick up a chair and throw it at a window which cracked. He had a record of 101 previous offences and was on a suspended prison sentence for failing to provide an alcohol specimen and disorderly behaviour. Stephen Duffy, defending, said Burns had been in the resort because his father had died from cancer aged 48. Burns was over for his dad’s funeral and had been to a wake before he recklessly caused the damage. A man stole food from a supermarket to sell to fund his heroin habit. Damien Griffin, 35, of Handsworth Road, North Shore, pleaded guilty to theft. He was given a 12 month conditional discharge and ordered to pay £43 compensation with £50 costs plus £20 victims’ surcharge. Prosecutor, Adrian Hollamby, said Griffin was caught on CCTV stealing £43 of cheese from Tesco on April 20. Griffin had previous convictions for shoplifting. He had been sentenced to a suspended prison sentence and drug rehabilitation course in May for stealing from a shop. Suzanne Mugford, defending, said her client had struggled for a number of years with a heroin addiction and at the time of the offence was using the drug. Griffin was now on a prescription for the heroin substitute methadone and no longer used street drugs. A teenage driver tried to kill himself by deliberately crashing into a parked car after he had been drinking. Ryan Savage later told police he was shocked after the car flipped and he had not died. Savage, 19, of Russell Gate, Fleetwood, pleaded guilty to driving with excess alcohol. 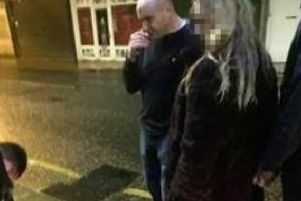 He was banned from the road for 14 months and fined £120 with £85 costs plus £30 victims’ surcharge. Prosecutor, Pam Smith, said police were called to an accident on April 10, on Fleetwood Road North, Thornton, where Savage’s Seat Leon had collided with a parked car. Savage’s jacket was found abandoned nearby. He was arrested and told police he had been in a low mood and wanted to end his life. He had drunk three bottles of WKD and vodka and orange then intentionally driven into a parked car. He added he was shocked when he had not died and had run off. A blood test showed 133 milligrams of alcohol in his body – 80 is the limit. David Charnley, defending, said his client, who had no previous convictions, had previously been sectioned under the Mental Health Act. A man caused damage valued at £500 his lodger’s property after accusing him of abusing his hospitality. Michael Barnes, 29, of Bloomfield Road, Blackpool pleaded guilty to damaging a bike, microwave, kettle toast and drawer unit. He was ordered to pay £375 compensation and £85 costs. When interviewed by police Barnes admitted damaging the other man’s property deliberately by taking a piece of wood and and smashed it over his belongings. He said he found it amusing and it was his intention for the property to be damaged beyond repair. Barnes was given a caution on the condition he paid £500 compensation but he only paid £125 so the case was brought to court.